Popular mobile code architectures (Java and .NET) include verifiers to check for memory safety and other security properties. Since their formats are relatively high level, supporting a wide range of source language features is awkward. Further compilation and optimization, necessary for efficiency, must be trusted. 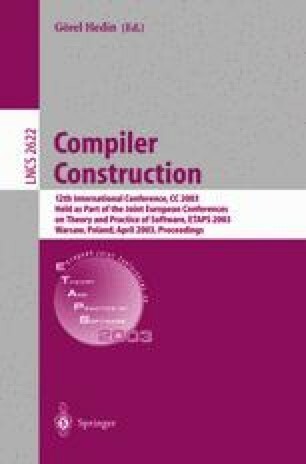 We describe the design and implementation of a fully type-preserving compiler for Java and ML. Its strongly-typed intermediate language provides a low-level abstract machine model and a type system general enough to prove the safety of a variety of implementation techniques. We show that precise type preservation is within reach for real-world Java systems. This work was sponsored in part by the Defense Advanced Research Projects Agency ISO under the title “Scaling Proof-Carrying Code to Production Compilers and Security Policies,” ARPA Order No. H559, issued under Contract No. F30602-99- 1-0519, and in part by NSF Grants CCR-9901011 and CCR-0081590. The views and conclusions contained in this document are those of the authors and should not be interpreted as representing the official policies, either expressed or implied, of the Defense Advanced Research Projects Agency or the U.S. Government. Java is a registered trademark of Sun Microsystems, Inc. in the U.S. and other countries. CaffeineMark is a trademark of Pendragon Software.